We are glad to share today the Haripaat Abhang of Sant Gnaaneshwar “Devachiye Dwari Ubha Kshanabhari”. "Simply stand before the gates of the Lord and chant the Bhagavan Namas the divine holy names of the Lord which gives all the Four of Muktis. The Punya derived from chanting the Bhagavan Nama is not measurable. Be in Samsara and keep chanting the Bhagvan Namas. Vedas and Shastras glorifies the greatness of Bhagavan Nama. This is the statement of Sage Vyasa. The king of Dwarka Sri Krishna stayed with Pandavas simply because of their Prema Bhakthi. Hence simply chant the Bhagavan Namas." 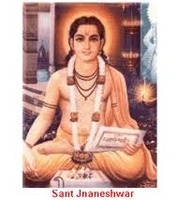 The Haripaat Abhangs forms the core basis of Vaarkari Sampraday started by Sant Gnaaneshwar. Let us hear and chant the Bhagavan Namas which gives all the Purushaarthas. Stand before the gates of the Lord and chant the Bhagavan Namas the divine holy names of the Lord which gives all the Four form of Muktis. Simply chant Hari Nama. Simply chant Hari Nama. Be in Samsara and keep chanting the Bhagvan Namas. Vedas and Shastras glorifies the greatness of Bhagavan Nama. Gnaaneshwar says this is the statement of Sage Vyasa. The king of Dwarka Krishna stayed at the house of Pandavas due to their Prema Bhakthi. Our mind is like a monkey. It rests here for a while and the next moment it goes far away. It is always hovering over the world. It always turns towards the attractions outside. Like a monkey, it jumps from one place to another place. If you find someone doing a service or good deed, the mind would tell you not to appreciate it. It will give you a reason that he does it for name. The mind always generates thoughts; thoughts which are mostly negative. Thayumanavar said that it is very difficult to control it. Then, how to keep the mind still, steady and quiet? The only way we can bind the mind is through devotion. The only way we can give expression to devotion is to chant Bhagavan Nama. Let us chant Bhagavan Nama and keep the mind away. Thank you for sharing such a beautiful song.